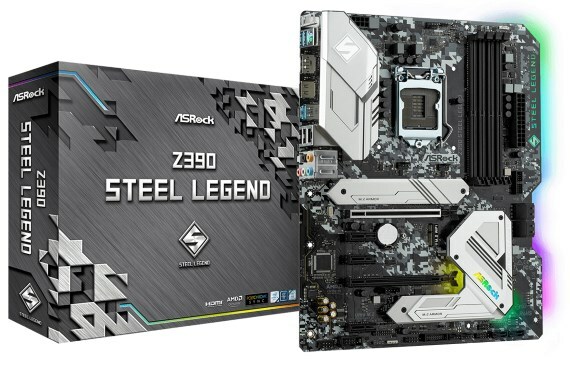 ASRock adds the Z390 Steel Legend to its motherboard portfolio. Aimed at Intel's 8th and 9th Gen Core CPUs, this motherboard feautres two PCIe 3.0 x16 slots, three PCIe 3.0 x1 slots, one M.2 Key E for WiFi, six SATA 6Gbps ports, two Ultra M.2 ports, two USB 3.2 Gen2 (type A+C) rear ports, and six USB 3.2 Gen1 ports (four front, two rear). The board has a black and gray design, features a stainless steel design PCIe slot, and has Polychrome RGB SYNC. Pricing and availability is unknown. ASRock has gone to great lengths to ensure optimum stability and performance while maintaining the spiritual philosophy of the Steel Legend series. The Z390 Steel Legend is ready for anything – no matter whether you're a performance enthusiast, a gamer or a professional video editor.